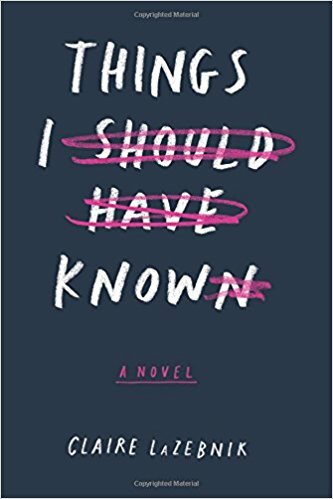 When I scanned the inside cover of Claire LaZebenik’s novel Things I Should Have Known, I knew that I was going to read this book. Not because it sounded particularly interesting, but because one of the main characters was autistic, and that always intrigues me because I am autistic myself. I opened the book on a sunny Saturday afternoon—with trepidation, because 99% of the time, autism (and other disabilities) in fiction are portrayed terribly and then I want to retch at the end. Young adult books, which is this book's category, are particularly liable to being not just ignorant about disability, but genuinely bad. That being said, I was pleasantly surprised by this book, because it wasn’t terrible. It was bland and predictable, and the writing was not especially good, but the author clearly knows autism—and autism was not the villain in the story. Things I Should Have Known centers around Chloe and Ivy, sisters aged 17 and 20. They live in Los Angeles, California, where Chloe leads the perfect life: she is blonde, skinny despite eating terribly and never exercising, has a rich, handsome boyfriend, and is smart enough to be in honors classes. That’s it, though: we are never told her hobbies, interests, dreams, or anything to really flesh out the character as a living person. Chloe’s life revolves around being perfect and taking care of her sister, and that’s it. Ivy is 20, plain in appearance, likes watching television and playing on her iPad, and goes to a special needs school. Ivy is verbal but struggles with many things that autistic people struggle with, such as social communication and changes in routine. LaZebnik definitely seems to ‘get’ how incredibly hard autistic people try all day long to be "normal," and how incredibly exhausting and anxiety-provoking it is. Chloe shows real empathy towards her sister and gets it in return. Ivy clearly adores Chloe and depends on her, while at the same time, she makes deliberate efforts to be the older sister that she knows she is, and to comfort and help Chloe in times of need. Ivy is constantly seeking Chloe’s approval and changing herself to please her sister, such as getting her hair cut and highlighted at Chloe’s suggestion, even though haircuts hurt for her. If you think autistic people are not capable of empathy, then you have not met Ivy. Unfortunately, it seems like LaZebnik was so busy making sure that Ivy was a fully-fledged person, she forgot that Chloe should be one, too, especially since it is told from Chloe’s point of view. She equally fails with the character of David, who is the younger brother of Ethan. It turns out Ethan and Ivy have been in the same class for years, as have Chloe and David, but they never realize this until Chloe decides that Ivy needs a boyfriend and starts planning social outings. David, being a dutiful younger sibling even more than Chloe is, comes along, and he and Chloe are soon on the path to a weird romance that we are never given any reason should exist, because both of the characters are flat as paper. One thing that this book does well is that it portrays autistic people as fully-fledged human beings with ideas and interests of their own, who are constantly being forced into boxes by well-meaning non-autistic people. Even though Ivy is not interested in Ethan, she wants to please her sister so much that she goes along with her plans. One thing that this book does not do well, however, is in its portrayal of autistic people as sweet, good, innocent and incapable of anger. Ivy gets confused and tearful when Chloe is shouting and ranting. And Ethan is almost a stooge, a caricature of your typical autistic male. He wants to be Ivy’s boyfriend and sets out to do so by following the rules set out for him by David, such as paying for snacks, participating in activities, and he shows his own devotion to being a ‘real’ boyfriend by doing research on topics that Ivy has interest in. Unfortunately, Ethan ends up getting dumped by Ivy because it turns out that Ivy, like many people on the spectrum, is gay; plus she never really thought that she and Ethan were dating in the first place; she was just going along with what her sister wanted. But being dumped so upsets Ethan that he does a runner and bolts, and his parents then decide to send him away to a boarding school. Although Chloe and David, who are by this time full-fledged boyfriend and girlfriend despite not having any chemistry whatsoever, are devastated, Ivy does not seem to have any particular feelings about this turn of events. David is convinced that wherever Ethan has been sent to, it is a torturous pit of snakes, and is very surprised when he and Ivy visit and find nothing of the sort. Instead it seems like a college campus where young autistic adults are supported and go to classes and are encouraged in their own pursuits. This is one of the things that rings most untrue to me: David’s parents, instead of hiring more support staff or sending Ethan to a weekly boarding school, were able to—in a matter of days—get him admitted to this fantastic institution (for it is an institution, locked gates and all) where he never comes home from and where his only visitors are Chloe, David and Ivy. I felt weird about this book. Judging by the reviews it got online, people are raving about it. But it is clear to me that that book was written for siblings of those on the spectrum or for those people who don’t know anything about autism; it wasn’t written for autistic people or autistic teenagers, who I think could seriously use a book where they found themselves portrayed accurately. For now, we will have to rely on memoirs, not fiction, for that. I definitely liked parts of it, such as when David and Chloe explain exactly why vaccines do not cause autism, or when Chloe muses about how hard Ivy works all the time to appear ‘normal’ despite the fact that she is experiencing horrible, constant anxiety. But other parts just fell flat. I think perhaps the author was too intent on educating people about autism, and how it isn’t a death sentence and not intent enough on writing a good book. There was a lot of dialogue, a lot of telling, not showing. LaZebnik was careful to dispel myths about autism but didn’t care that she’d made Chloe into a most stereotypical valley girl, blonde highlights and all. We know that Chloe cares about Ivy, David and Ethan, but whether or not she cares about anyone or anything else, we never find out. Overall, I would recommend this book, especially to teen siblings of those on the spectrum, but I would read it alongside a teen on the spectrum and discuss it with them to make sure that they understand that Ivy and Ethan are no more your average autistic person than Temple Grandin is. There wasn’t any new information for me in the book, but I can definitely see how people who don’t know many autistic people (and you should, because we’re awesome!) would benefit from reading it.